All timetables are based on a the Southeastern May 2018 timetables, the Govia Thameslink timetable, and Eurostar 2018 summer timetables. These can be downloaded directly from the operators. A session file has been included for the Hildenborough to Ashford Intl afternoon rush hour. Watch for high-speed through trains first thing in the morning. You may want to hold semi-fast services at Sevenoaks to let them pass ahead. No trains on these timetables use the Chatham loop. You may automatically route through that junction. 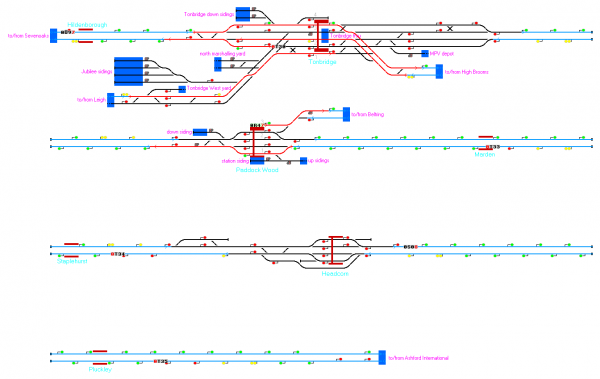 Watch out for the change of destination after the rush hour: Beltring trains switch to terminating at Tonbridge rather than Paddock Wood during the day. Watch for early trains carrying platform numbers. If you don’t deliver to the right platform, you will have problems getting them to their destinations. The Westenhanger branch and the High Speed line is fully reversible on both lines in both directions. In practice, on the included timetable, all trains enter in on one line and are expected to depart on the other.